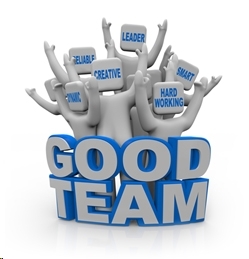 Teamwork - The key to working together • Safety Boss Inc.
A “team” consists of two or more individuals engaged in an activity to reach a common goal. When we think of “teamwork” it is usually in the context of completing a task or a job together and working together on the job has many benefits; physically helping each other distributes the work load, increases productivity and reduces the risk of injury. The key to working together effectively and efficiently is to offset the weaknesses with each other’s strengths. One person may be able to reach higher or lift more and another may be more agile or faster with numbers. Therefore, compatible individuals will invariably find ways to work together that are mutually beneficial. Because we work together and take on greater challenges, the more capable and productive we become. Another positive benefit of teamwork is a healthy sense of competition among coworkers. This helps in several ways by keeping everyone on their game, easing tensions and creating a sense of community. Especially in a camp work environment, where many of us work, teamwork goes a long way to getting through the day and enhancing our quality of working life. When we work together in larger groups on more complex jobs, we can overcome problems by sharing ideas from each individuals’ unique set of knowledge and experiences. The more knowledge we share, the more we gain. EDITOR’S NOTE: Originally published in June 2016 and updated for freshness, accuracy and comprehensiveness.